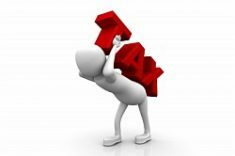 Home » Blog » Real Estate Taxes and fees » What is Capital Gains Tax on Real Estate? Taxes are indeed inescapable and the real estate industry is no exception. I am sure a lot of real estate investors are very much interested to know the taxes involved in investing as they significantly impact the total cost of acquiring a property. What may seem like a good deal may turn out to be a bad one, if all the taxes are factored in. 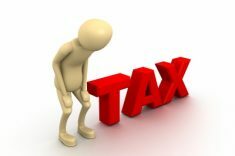 So before you go ahead and plunge into the world of real estate investing, I suggest you take the time to study taxes. For this post, I will be discussing capital gains tax on real estate. I’ll try to discuss capital gains tax on real estate in layman’s terms, based on what I have learned, for purposes of information-sharing. A disclaimer is in order of course: While great effort has been taken to ensure the accuracy of the discussion here as of its writing, this is not intended to replace seeking professional services. Do read up on the relevant laws and regulations also. When there is a sale of real estate, automatically people think that they have to pay Capital Gains Tax (CGT). This is not necessarily the case. CGT is a tax on the gain from the sale of capital assets. Regular corporate income tax (RCIT) [for corporations] and regular income tax [for individuals] apply to the sale of ordinary assets while CGT applies to the sale of capital assets. Thus, we first have to determine whether the asset being sold is a capital or an ordinary asset so as to know the proper tax rate to be used and the BIR form to be used, among others. As applied to the real estate industry, the terms “capital assets” and “ordinary assets” are defined in Section 2(c) of Revenue Regulations (RR) No. 7-2003 dated December 27, 2002. It’s essentially the same as the above definition. It has an additional provision, though, on real properties acquired by banks through foreclosure sales – the same are considered as their ordinary assets but banks shall not be considered as habitually engaged in the real estate business for purposes of determining the applicable rate of expanded withholding tax. Thus, it appears that it is not only the sale of land and buildings or houses which we should be focusing on, but also the sale of the above. As RR No. 7-2003 is a very important rule on real estate, I have included the said regulations in this post for your reference. Read it in its entirety. You may download a copy here. 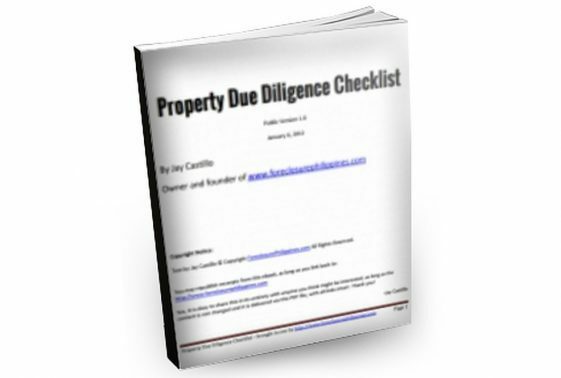 Answers to frequently asked questions can be found in this document. In simple terms, if the property is not ordinarily held for sale (as inventory) or used in business and subject to depreciation, then the property is a capital asset. 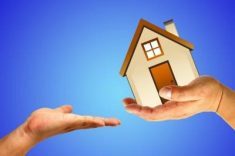 Now, if a seller is engaged in the real estate business, and the property is one he holds out for sale to the public, then the property may be considered as an ordinary asset. Conversely, if a seller is not engaged in the real estate business, and the property is not used in business and subject to depreciation, the property may be considered as a capital asset, the sale of which is subject to CGT. Section 3 of RR No. 7-2003 provides the Guidelines in Determining Whether a Particular Real Property is a Capital Asset or Ordinary Asset. When the real property which is a capital asset to the seller is sold, the gross selling price or fair market value (FMV) [zonal value], whichever is higher, will be subject to 6% CGT. Please refer to the BIR website http://www.bir.gov.ph/zonalvalues/zonalvalues.htm for the zonal values. Technically, it’s not really only the gain (selling price less cost) which is taxed, because even if the seller suffered a loss (that is, the selling price is lower than the original acquisition cost of the property), there will still be CGT, because a gain is always presumed. 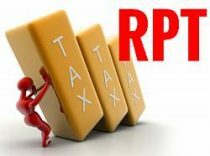 On the other hand, if the seller is engaged in the real estate business, and the real property sold is an ordinary asset, the sale will be subject to RCIT [or minimum corporate income tax (MCIT), when applicable] if the taxpayer is a corporation and income tax if the seller is an individual. The proceeds from the sale of the real property will be included in the seller’s global income (meaning income from all sources – note that domestic corporations and resident citizens are taxed on all sources of income, whether from within or outside the country) and only the net income, after allowable deductions such as depreciation, losses, etc. will be subjected to RCIT, MCIT, or regular income tax, whichever is applicable. Under Republic Act No. 9337, the RCIT is now 30% on net taxable income (beginning on January 1, 2009, down from 35%). The regular income tax for individuals remains at 32%. Please note that there is an exception to the application of the CGT, and that is the sale of a principal residence (your own home). This deserves a separate discussion as I intend to take advantage of this when we purchase our next residence. Assuming that you are interested in buying a property from a seller who is an individual and who is not engaged in the real estate business, the seller needs to pay CGT on the sale of his real property, unless you have made an agreement that you as the buyer will shoulder this. The seller needs to file BIR Form No. 1706 within thirty (30) days after each sale, exchange, transfer or other disposition of real property. You can download BIR Form No. 1706 here. Additional requirements may be requested for presentation during audit of the tax case depending upon existing audit procedures. 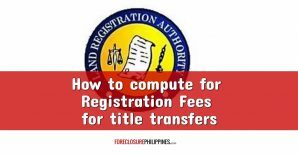 You just have to file the Capital Gains Tax return in triplicate (two copies for the BIR and one copy for the taxpayer) with the Authorized Agent Bank (AAB) in the Revenue District where the property is located, along with the documentary requirements and the tax due. In places where there are no AAB, the return will be filed directly with the Revenue Collection Officer or Authorized City or Municipal Treasurer. You can view the Revenue District Offices (RDO) here: http://www.bir.gov.ph/directory/rdo.htm. Click on the concerned RDO. For example, if you click on RDO 48 – West Makati, you will get to http://www.bir.gov.ph/directory/rdoinner.htm#48. The names of the Revenue District Officer and Assistant Revenue District Officer as well as their contact numbers and e-mail addresses, and the address of the Revenue District Office and the AAB’s within the said RDO may be found there. A residential condominium in Makati City with a floor area of 50sqm has a Selling Price (SP) of 1.0M. The existing zonal value per square meter for that condo in Makati is currently Php50,000/sqm. You have called the owner and found out that he is not engaged in the real estate business. He also told you that as part of the deal, the buyer shall shoulder the CGT. As the buyer, how much is the CGT which you will have to pay the seller on top of the selling price? Therefore, the buyer shall have to shell out an additional 150,000 pesos. Note that while technically, the CGT is always the responsibility of the seller, and that if the buyer shoulders the CGT, it is in effect part of the selling price to be compared to FMV for purposes of computing the 6% CGT, I noted that the practice of banks is to compute the CGT this way. Now, what if you called up the seller and told him that you are willing to buy the property but he should shoulder the capital gains tax as the seller, then he counters your offer and says he is willing to shoulder the CGT up to his selling price and the buyer shall shoulder the CGT for the excess or the difference between the SP and FMV, how do you compute for the CGT? Take note that the total CGT is 90,000 pesos + 60,000 pesos = 150,000 pesos, which is consistent with our first computation. The CGT was just split between the buyer and the seller. As investors, we should always try to negotiate for the best terms and in relation to this particular example, always try to have the other party shoulder the CGT. 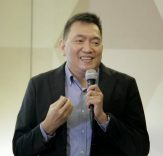 The seller will still be the one to file the CGT and he shall have to file the return in an Authorized Agent Bank within the Revenue District where the property is located in Makati, within 30 days the deed of sale was executed. 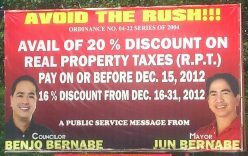 The BIR website (http://www.bir.gov.ph) has a wealth of information on taxes. Refer to it from time to time. The BIR also has a 24-hour contact center (Telephone number 981-8888) and you can call them if you have any questions. You may also e-mail them at contact_us@cctr.bir.gov.ph. You can also ask me through the comments section and I will do my best to research the answer. In my next posts, I will be discussing Value-Added Tax (VAT), expanded withholding taxes (EWT) a.k.a. 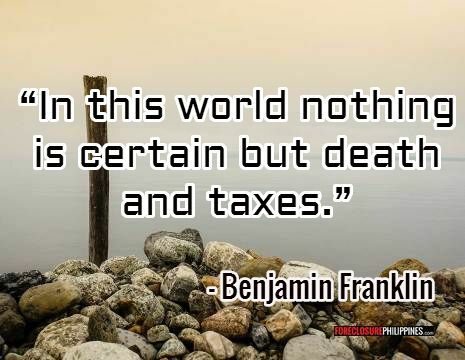 creditable withholding taxes (CWT)**, Real Property Taxes (RPT), Transfer Taxes (TT), CGT on the sale of a principal residence, and estate taxes (as I am sure many of you are also interested in transferring your properties to your heirs in the future – remember, aside from taxes, death is certain too). Let me know, through the comments section , if you have any other taxes you would like to know about, or if there’s anything you would like to have any clarification on. In closing, please remember that as an investor, one should always consider the capital gains tax in real estate transactions. 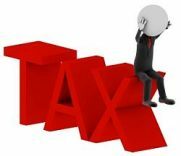 Failure to do so could mean your real estate capital gains will just get eaten up by the corresponding capital gains tax and turn what looked like a good deal into a bad one. *This article was written with the help of my wife, who happens to be a certified public accountant and a lawyer.